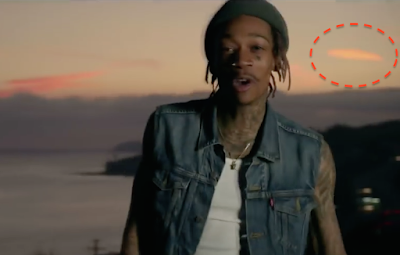 UFO SIGHTINGS DAILY: Wiz Khalifa Catches UFO In His Recent Video, See You Again, May 2015, UFO Sighting News. Wiz Khalifa Catches UFO In His Recent Video, See You Again, May 2015, UFO Sighting News. Guys, there are a couple of videos released of the song See You Again, but I first noticed this UFO disguised as a cloud in the Taiwan version (1st video below). 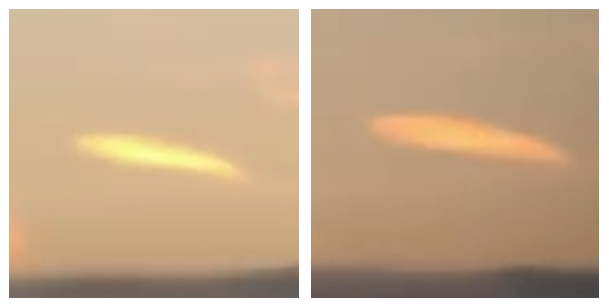 At the 1:12 and 2:27 mark of the Taiwan version of the video we see the UFO cloud on the far right of the screen. Then in 2-4 seconds it a few minutes later in the same position, but with different lighting, so now the UFO is glowing all out. Kind of amazing. It looks like the UFO was trying to look like a cloud but failed. I believe it was observing the singer and his crew filming the video. And why not? Seeing Wiz Khalifa doing his thing in front of the cameras and for a good cause, the death of a friend. Now, I mean no disrespect to the passing of Paul Walker. His passing hurt us all and I spoke about him to my Taiwan students numerous times about the good things he's done for others. My wife, son and I saw his last movie and it brought tears to our eyes.